The Houston City (3) was sold to TMM in 1972 and was renamed Maria Elisa. It was managed by Reardon Smith until the ship was sold in 1980. 1963 Delivered to Reardon Smith Line. 1972 Sold to TMM and renamed Maria Elisa. Managed by Reardon Smith. 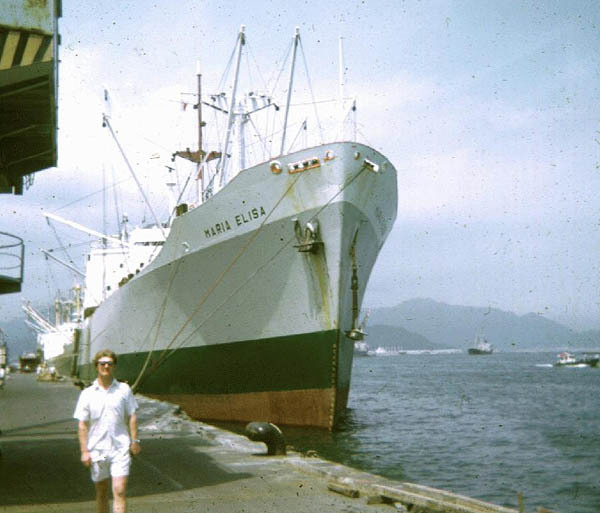 This photo was taken in 1972 at Shimizu, if I had had a better camera you would possibly see Mt Fuji in the background. The guy in the photo was the 4th engineer Frank Robinson. Willie Davies. Copyright © by Willie Davies. An interesting point in the photo is the fact that we were still changing her colours to TMM and it will be observed that the fore topmast and mast table were still in RSL mast colour. The complete changeover was effected by the ships crew without any shore assistance. I believe the actual name change was done by Yokohama Engineering. Vessel still remained registered in Bideford. John Cann. Voyage March to September 1972. Master: J.Cann, C/O: Evan Walmsley, 2/O: Julian York, 3/O: Colin Bowell, R/O: John Carwardine, C/E: Dave Litson, 2/E: Charlie Primrose, 3/E: Pete Magorian, 4/E: Frank Robinson, J4E: Norrie Caroll (later replaced by Dave Ricketts), J/E: Willie Davies, J/E: Stuart Millar, Elect: John Gardiner, C/Stwd: Evan Sefton.